Molly, my wife, and our three kids picked apples last week at my folks’ place. A lot of apples. Apples may well be the zucchini of the fruit world: “it didn’t seem like I planted that many…” One taste of these home-grown, 10′ cyclone fence-protected, lovingly-pruned and hastily-picked beauties, though, and you know fall: tart, crisp and gone too soon. Yesterday, four friends and I kayaked on a little inland lake just north of Cross Village. We left shore paddling into the wind (years of guiding experience on my part) and returned paddling into a stronger wind (err, well…) and made it to shore just as the storm started to kick up. Just classic fall: outrageous colors on the hill sides, skittering kingfishers, a spooked eagle swooping low and away and a beaver dam the size of a truck. I was reminded of two things, distinctly: paddling through reeds is absolutely cool, and lilly pad roots are absolutely creepy. People pretend to not really notice. I see through them. When those babies bump up along your boat…it is a good thing the Blair Witch people never saw lilly pad roots. Go ahead. I dare you to google. Molly is working with the Emmet County Leave No Child Inside effort, an outreach program that focuses on getting kids outside for free and unstructured play, inspecting, exploring, discovering what it is that makes up this world, and what it is to play on their own terms. The movement has taken off recently, and has infiltrated an astounding number of schools, urban and rural parks and communities. Which brings me back to lilly pad roots. While we were kayaking yesterday, we were messing around. 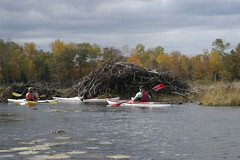 We were awed by the beavers’ work, mesmerized by the eagle’s size and grace — we were playing. Getting kids outside in this amazing season – figuring out where the green in leaves goes, watching a gust strip an ash tree of its brown coat — this is what makes it whole. My kids would love to see a lilly pad root, and they will this weekend. Maybe. I’m not touching the thing. Maybe they will see where the lilly pad grows. If you have a favorite place to take your kids, a favorite cider mill or a favorite lilly pad recipe (please, no pictures), please share! Thanks for your blog, Josh! Great ideas, tips and inspiration for getting out! I took part in this kayak excursion. Josh’s outdoor skills menuvered us through the reeds, up small streams and into open water (which really was a tough paddle back). Josh worried about the lilly pads, while I was concerned that there were busy beavers at work near their damn…… All fears aside this was a wonderful way to spend a warm fall day. Northern Michigan in it’s finest! 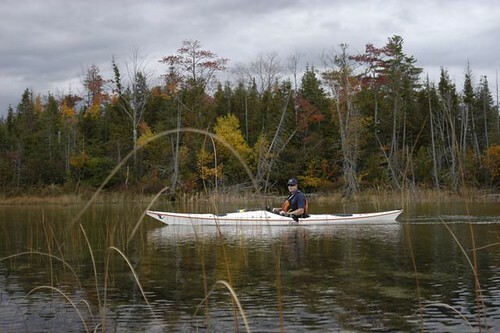 Anyone looking for a kayak adventure should consider calling Josh at The Outfitter in Harbor Springs. It will be an experience to remember for many days to come. Thanks Josh, we look forward to many more adventures!